Finally available in paperback, Ralph D. Sawyer's incomparable study of ancient Chinese warfare. One of the most profound studies of warfare ever written, The Seven Military Classics of Ancient China presents us with an Eastern tradition of strategic thought that emphasizes outwitting one's opponent through speed, stealth, flexibility, and a minimum of force - an approach very different from that stressed in the West, where the advantages of brute strength have overshadowed more subtle methods. Safeguarded for centuries by the ruling elites of imperial China, even in modern times, these writings have been known to only a handful of Western specialists. In this volume are seven separate essays, written between 500 B.C. and A.D. 700, that preserve the essential tenets of strategy distilled from the experience of the most brilliant warriors of ancient China. This accurate translation remedies a serious gap in Western knowledge of Asian thought. Based on the best available classical Chinese manuscripts, some only recently discovered by archaeologists, The Seven Military Classics of Ancient China is a uniquely important contribution to the world's military literature and is essential reading for anyone interested in China's rich cultural heritage or in the timeless principles of successful warfare strategy. ©2003 Ralph D. Sawyer (P)2010 Audible, Inc. The books contained in this set are: T’ai Kung Liu-t’ao (Six Secret Teachings), The Methods of Ssu-ma Fa, Sun-tzu Ping-fa (Art of War), Wu-tzu, Wei Liao-tzu, Huang Shih-kung San-lueh (Three Strategies), and Questions and Replies between T'ang T'ai-tsung and Li Wei-kung. The more you understand Confucian thought and its impact on Chinese statecraft, the more incredible and terrifying these works become when you consider what might have been without Confucius. For those approaching this book without knowing what to expect, let it be said this tome is not for the faint of heart. It is a heavy-duty slog for scholars and those with heavier levels of enthusiasm for the subject matter. Each book in this set is worthy of deep thought and consideration, and for that reason I would suggest digesting it in bite-size offerings. If you tear through it, it'll run together, and you won't benefit from it. For general audiences, my recommendation is to seek out a copy of The Art of War and see if it holds your interest. If it does, this book is probably for you. Chances are, you likely already know up front, which is why you're looking at this book in the first place. The Art of War is the only one of the texts in this collection that has been readily available for English speaking audiences. I'm glad this oversight has been corrected because the other books in this set are every bit as valuable. To compare and contrast these works is to better understand history, people, and yourself on levels you might not expect. It really depends on where your focus lies and how you apply the knowledge. Warriors, philosophers, and businesspeople will use the same ideas in different ways, and some will see no separation at all. Regardless of how you apply it, you will not walk away from this unchanged on some level. I would recommend this book to any serious student of strategy. The book is littered with stories some real some fiction, but clarify the points mentioned. What does James Chen bring to the story that you wouldn’t experience if you just read the book? He reads with a tone that is easy to listen to, and fall asleep if you don't mind yourself. You can not listen to this book at one time. It is some 18 hours long. You should be stopping to take notes, and look up names, places and battles. I bought this audiobook and a companion to the hardcover book. I read and listen to them together. I made it easy for me to underline in pencil important lines in the book and take notes on thoughts. If you have a curiosity about ancient Chinese war strategies, then this is a must read. I find the strategies applicable for modern day corporate conflicts. Not as good as The Art of War, but a Worth While Read nonetheless. A good introduction to military strategy. Yes. 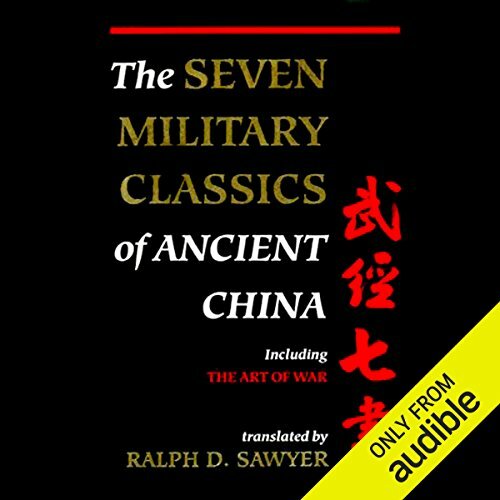 If you are interested in the history of politics, military strategy, wars, and Chinese history, this audiobook is a good introduction to these topics. Nothing. The narration seemed fine. Do you think The Seven Military Classics of Ancient China needs a follow-up book? Why or why not? Not sure. There are other ancient military strategy books out there, including a few from Japanese writers. It would be easy to choose some of these as a follow-up book I guess.